Newgrange is a Passage Grave – a type of Megalithic ( large stone) Tomb consisting of a narrow passage leading to a chamber where human remains were found. Newgrange the largest megalithic Tomb in Ireland. It stands in the Boyne Valley in Co Meath near two other Passage Graves; Knowth and Dowth. Newgrange was constructed during the Neolitihc Period ( Late Stone Age ) around five thousand years ago ( 3200BC). Newgrange is one of the most impressive stone structures ever built. It is older than the Pyramids in Egypt or Stonehenge in England. Newgrange was built by the Neolithic ( late Stone Age) people as a Tomb to hold the cremated remains of dead people inside a chamber. Excavations at Newgrange revealed the remains of 5 individuals. This Passage Grave was designed in such a way that for a period of time occurring once a year, around the time of the Winter Solstice – 21st December, the chamber which is normally a very dark place would light up with the dawn sunrise for a period of up to 17 minutes depending on weather conditions. Should the weather be bright and sunny this phenomena can happen at each dawn from 18th to 23rd December. 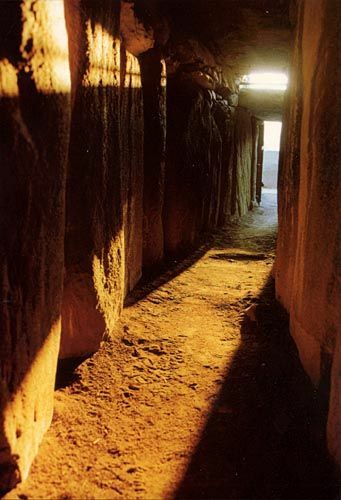 Many believe that Newgrange was built as a form of sun worship. We may never know the exact funtion of Newgrange but we can be sure that these Neolithic people had a respect for their dead and for the sun. These Neolithic builders were very skilled at construction techniques and astronomy and used their skills to bring the winter solstice dawn light to illuminate the remains of their dead. The large mound or cairn is approximately 11 meters high and on average 80 meters in diameter. The cairn is made up of thousands of water rolled stones that were collected from the river Boyne. It is estimated that the cairn weighs 200,000 tonnes. The cairn is surrounded at its base by a ring of 97 large boulders called Kerbstones. Surrounding the entire site at Newgrange is a ring of Standing Stones. Several of these stones are now missing. 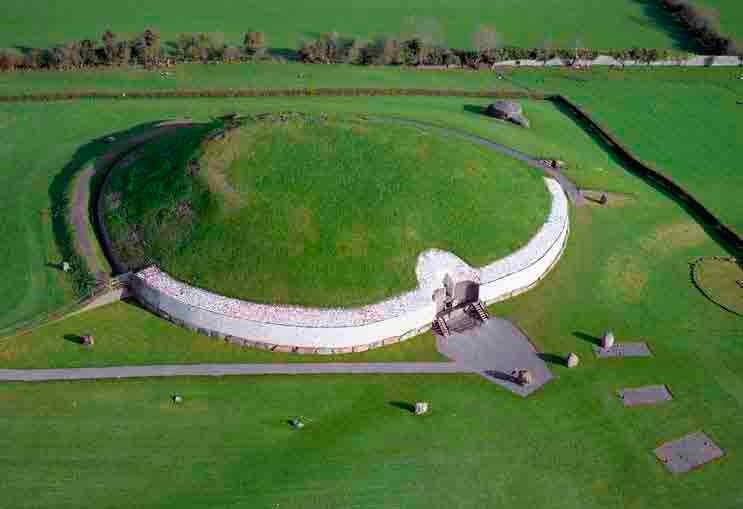 Aerial view of Newgrange. Courtesy of the Office of Public Works ( OPW). The passage is long and narrow being 19 meters in length. The passage walls are made up of large stones placed upright – these are called Orthostats. There are 21 orthosats lining the right of the passage and 22 on the left. Above the entrance to the passage is a rectangular shaped opening called the Roofbox. It is this Roofbox opening that allows the light to shine down the passage on the Winter Solstice. The Roofbox is located high up above the entrance to the passage however the passage floor gradually rises along the 19 meters of its length so that as it enters the chamber the floor has become level in height to the Roofbox. It is this feature that allows the rays the dawn sunlight to travel down the 19 meters of the passage and to reach the chamber deep inside. 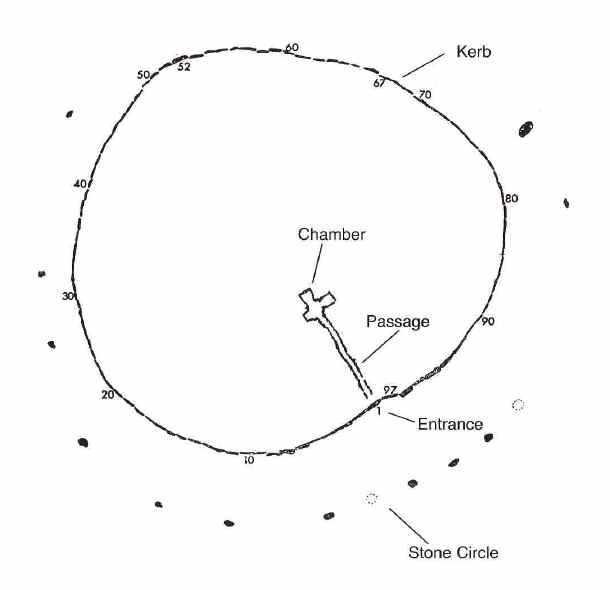 In this drawing you can see the path of the sunlight as the travels through the roofbox and down the long passage into the chamber – lighting up the basin stone. Drawing by OPW. 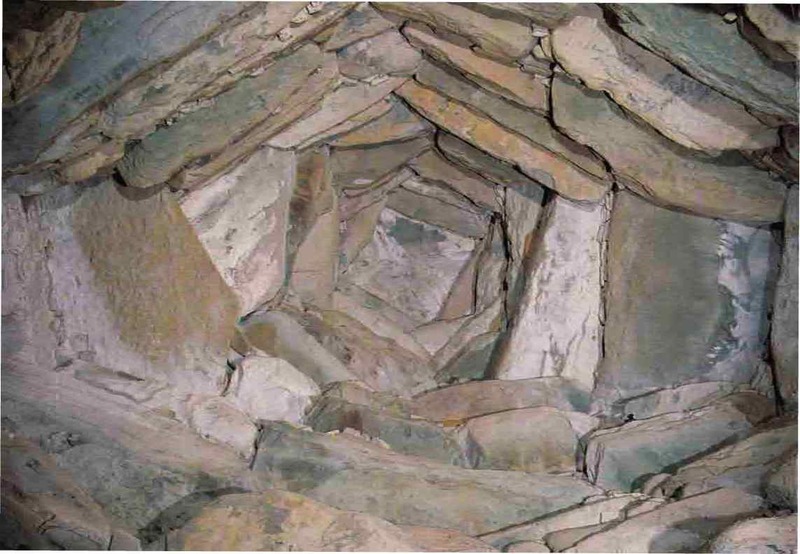 The Chamber is quite small but the roof of the chamber is very high- this is called a Corbelled Vault. The roof is built using a technique called corbelling. This involves stacking stones in such a way that they narrow gradually as the rise. 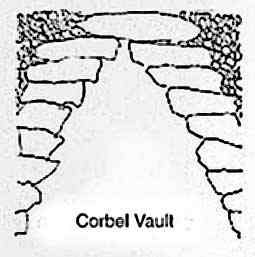 A corbelled Vault was needed as it was strong enough to hold up the enormous weight of the cairn which presses down from overhead. The Chamber is cruciform in shape opening out into three recesses or side-chambers. Each side Chamber contains a basin stone which held the cremated remains of the dead. Corbel Vault. The technique of corbelling involves stacking stone so that as it slowly rises it gradually narrows until only a single capstone is left. Corbel Vault at Newgrange. In this photo you can see that as the vault rises it becomes narrow and it ends finally in one capstone. 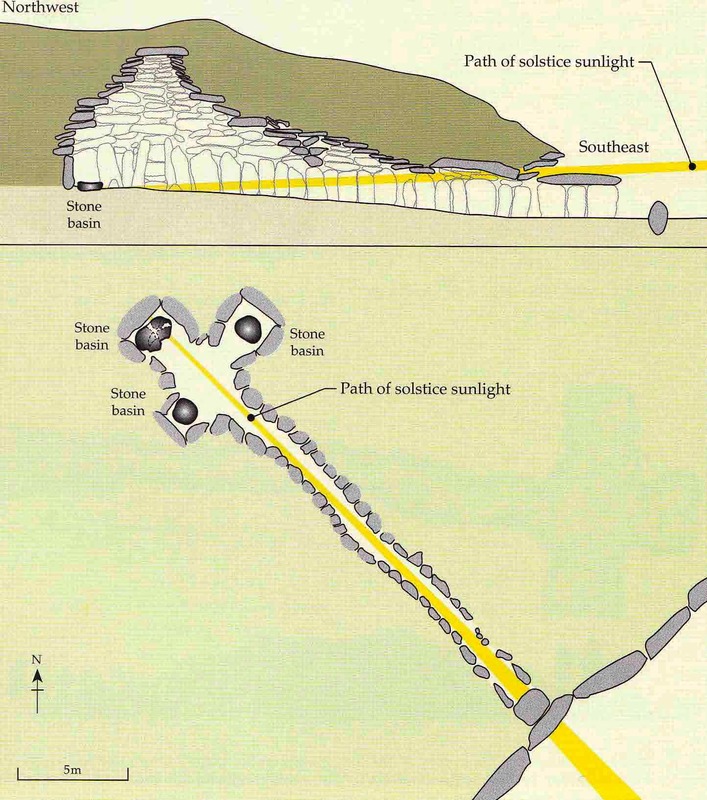 Watch this short video on Newgrange to get views of inside the passage tomb. The Facade fronting Newgrange is the only part of the structure that was not built by the Neolithic people. When the site was excavated by Archeologists in the 1960’s and 70’s they found a large amount of white quartz stones on the ground in front of the entrance. They decided to use this stone to build a facade for the tomb. Since then this facade has been greatly criticised as not being authentic to the original structure built by the Neolithic people. Much effort and time was needed for collecting materials for the construction of Newgrange. Remarkably, huge amounts were carried vast distances to the building site at Newgrange. 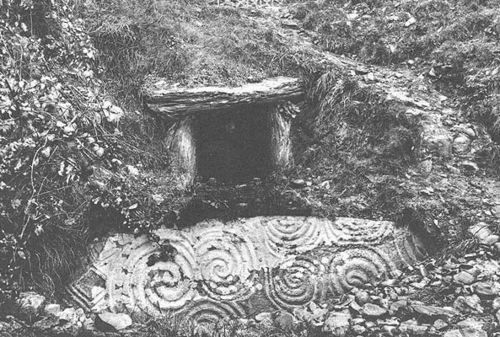 The majority of structural stones in the Boyne Valley tombs are greywacke. 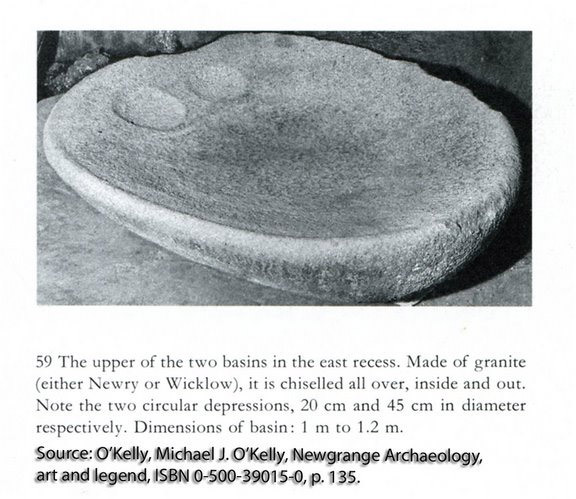 This stone type was quarried in the Clogherhead area, north of Drogheda Co Louth. Other granite boulders used in the structure were collected from the North shore of Dundalk Bay. 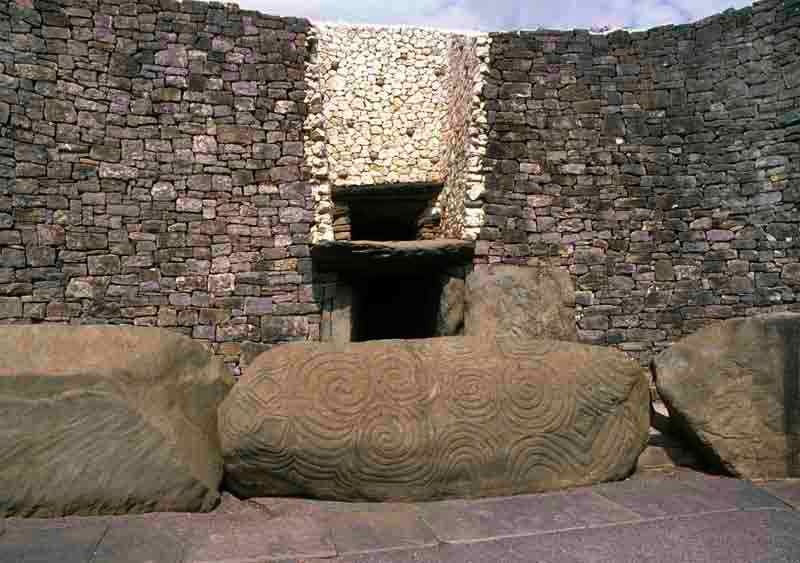 The facade at Newgrange consists of white quartz, which has its origins in the Wicklow Mountains.. 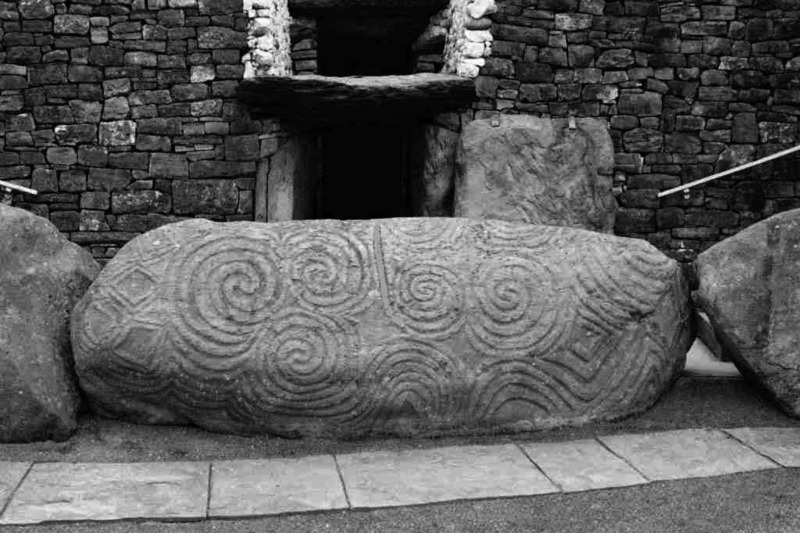 The long distances suggest that stone was carried by ship along the sea and the up into the river Boyne whose bank is located one kilometer from Newgrange. . 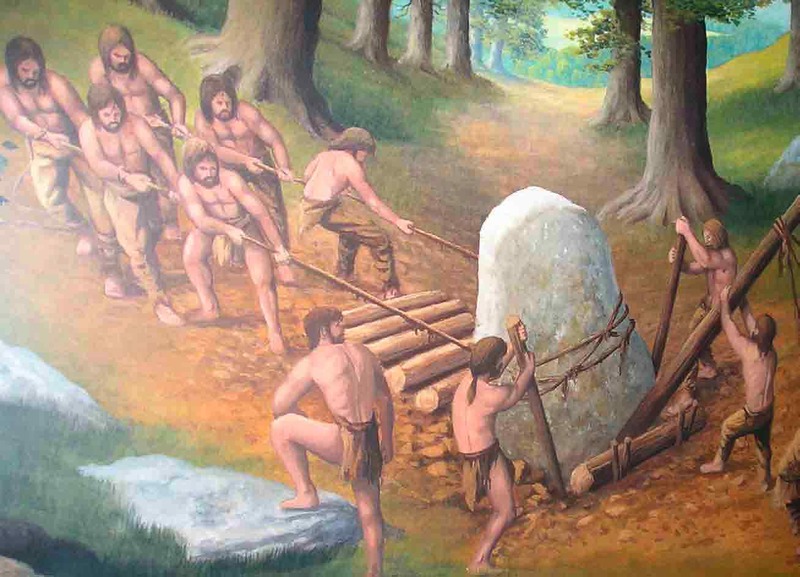 In order to get the stone up the 1km distance uphill from the river Boyne, it is most likely that the Neolithic people used the transportation technique of logrolling. Wooden scaffolding and earthen ramps would have been used to lift and put the stones in place. Negrange is famous for the standard of Neolithic art which is found at the Tomb. A wide range of motifs or symbols are used in Newgrange; circles, spirals, arcs, chevrons and lozenges are among the most common. It has been suggested that these geometric motifs have a symbolic or magical meaning but there is no real evidence of this. 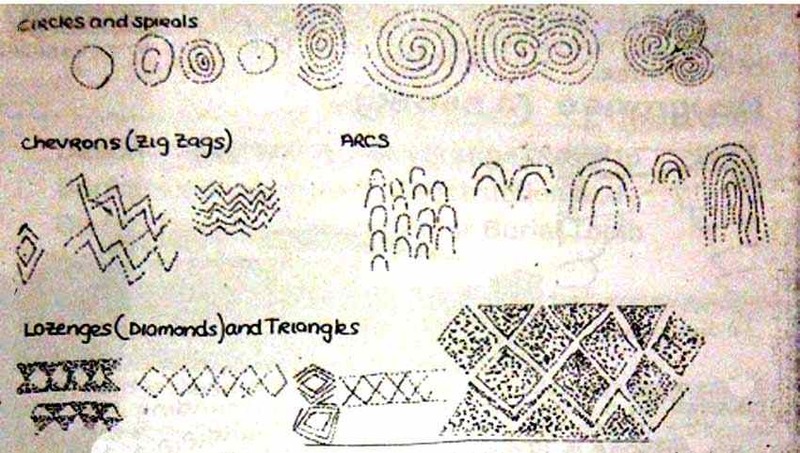 Whatever the meaning of these motifs may be they remain as remarkable examples of Neolithic Art in Ireland. Although carved motifs are to be found both inside the passage and the chamber the best of the carving is reserved for the outside of the tomb on the Kerbstones. The most well known and impressive of these are Kerbstone 1 ( The entrance stone) and Kerbstone 52 ( directly at the back of the tomb). These two kerbstones display an exceptional degree of artistry and craftmanship. Kerbstone 1 ; The Entrance Stone is 1.3 meters high and 3.2.meters long. Spirals dominate the design which are carved to 1cm depth and 1cm width. A Large Triple Spiral taking up approximately one third of the surface is surrounded by lozenges and smaller spiral designs. Kerbstone 52 is placed directly at the back of the mound, opposite Kerbstone 1. A large verticle groove is a natural feature of the rock which divides the stone in two. Pockmarks are other natural features on the stone. The artist who designed the carving incorporated the groove and the pockmarks into the overall composition. Spirals and lozenges occur on the left of the design and arcs and oblong shapes dominate the right. Kerbstone 52 . Courtesy of Department of Arts Heritage and Gaeltacht; Ireland. 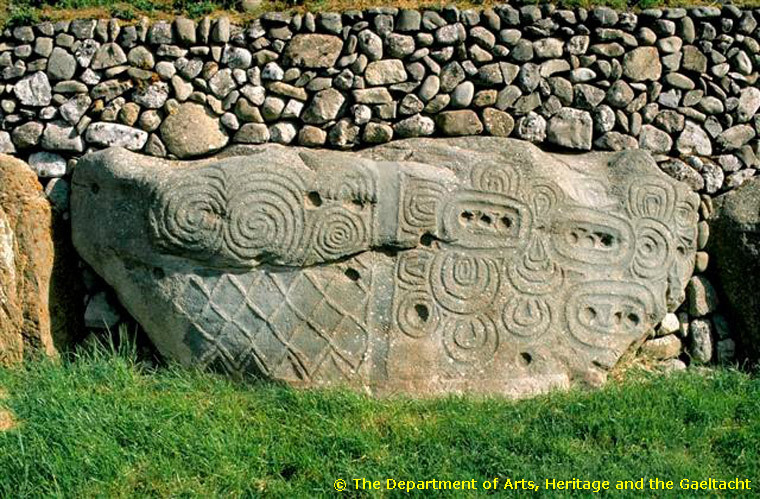 The carvings at Newgrange are entirely made using a sharp stone such as Flint. The techniques used are called “Pick Dressing” and ” Incision”. In Pick Dressing the design was picked out bit by bit using a flint and then smoothed over with a pebble. In this way- very deep designs were carved into the stone such as occur on Kerstones 1 and 52. At other parts of the tomb motifs may not be so deep. These more shallow designs have been scratched into the surface of the stone – this technique is called “ Incision”.